TAMPA, Fla. — One side effect of voting for the Hart Trophy can be an overdose of complexity. Are you voting for the NHL’s best player or the player most valuable to his team? It’s an annual rite of mind-bending torture. This year, when the Professional Hockey Writers’ Association revived mid-season awards voting for the first time since the 1960s, I tried to make it a little simpler. Winnipeg Jets forward Blake Wheeler was my No. 1 choice for the Hart. It wasn’t because Wheeler is necessarily the Jets’ most valuable player – you could make the argument that is netminder Connor Hellebuyck, considering goaltending is a big reason why Winnipeg missed the playoffs the last three years. Instead, I believe Wheeler has been the NHL’s best overall player this season. In the spirit of full transparency, my five selections for the Hart Trophy were Wheeler, followed by Colorado’s Nathan MacKinnon, Tampa Bay’s Nikita Kucherov, Boston’s Brad Marchand and Edmonton’s Connor McDavid. Kucherov took home the PHWA half-season Hart, while MacKinnon and John Tavares were the other two finalists. Wheeler, 31, finished fifth in voting. He received two other first-place votes and appeared on approximately 40 per cent of the ballots. Somehow, Wheeler remains one of the NHL’s best-kept secrets, even though he has the fourth-most points in the league over the last three seasons. Maybe it’s the fact that he plays in Winnipeg. How else to explain why this weekend will be Wheeler’s first All-Star Game appearance? The Jets entered the break in first place in the Central Division thanks in no small part to Wheeler, who has 15 more points than his next closest teammate. At the break, Wheeler is tied for 10th in points with Connor McDavid at 54. He has 14 goals and 40 assists, on pace for a career-high 66 assists and 89 points. Wheeler is second in the NHL in first assists with 29. He is fifth in primary points (goals plus primary assists) behind only Kucherov, Tavares, MacKinnon and Phil Kessel. There is no doubt Wheeler’s numbers are impressive. The strength of his candidacy has been his consistency. 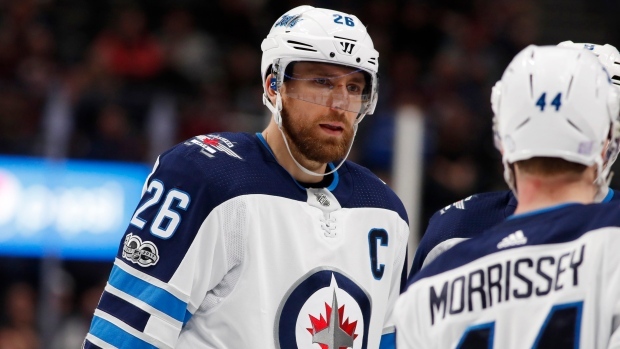 But what swayed my vote is the last month of action, as Wheeler practically carried the Jets once his partner in crime and point-per-game producer Mark Scheifele went down on Dec. 27. The Jets are 8-2-2 in those 12 games without Scheifele and Wheeler has 12 points. He did that while moving from right wing to centre to fill the void Scheifele left in the lineup. Wheeler didn’t miss a beat – and that was after driving play from the wing for the first 38 games of the season, which is difficult to do in today’s NHL. Maurice said he thinks Wheeler transitioned to centre easily because of the work he put in with Scheifele over the years. There aren’t many players in the NHL who have played with linemates as consistently young as Wheeler has. He entered the break with 19-year-old Patrik Laine and 20-year-old Jack Roslovic as linemates. Aside from Scheifele, his other two common linemates are a pair of 21-year-olds in Nik Ehlers and Kyle Connor. Maurice mentioned Wheeler in the same breath as two Hall of Fame captains he also coached – Ron Francis and Mats Sundin – in terms of leadership and play. So, if Wheeler wasn’t the Jets’ MVP in the first half, Maurice would argue he is right there.